Restored to its former glory? Tonight’s replica is another model for sale. This one is a little pricier. 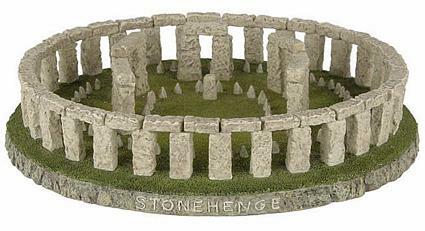 It’s also one of those that attempts to portray Stonehenge not as it is now, but as it is thought by many to have looked at its height, with all stones standing. Sold by the Museum Store Company. Another manufactured one, and a bit too neat. This one scores six druids. ← We’ll let Smithsonian Channel start us off . . .